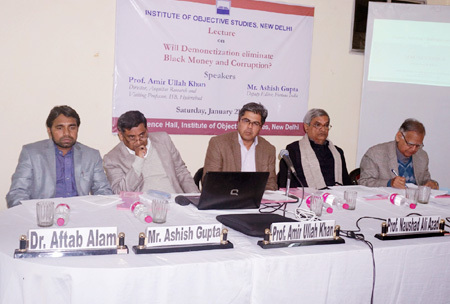 A lecture on “Will Demonetisation Eliminate Black Money and Corruption?” was organised by the Institute of Objective Studies at its conference room on January 21, 2017. 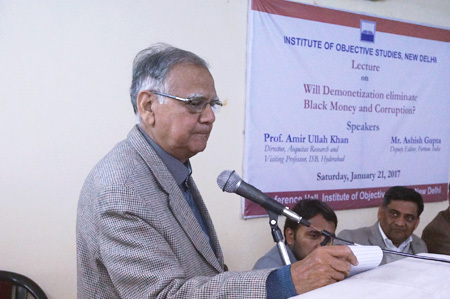 Prof. Amir Ullah Khan, Director, Aequitas Research and Visiting Professor, ISB, Hyderabad, who was the main speaker, held that the announcement to demonetise high-value currency notes of Rs 500 and 1000 denominations, was not necessitated by any economics but by extraneous factors like casualties of army jawans in Pathankot, situation created by the suicide of Rohit Vemula in the Central University of Hyderabad and disappearance of JNU student, Najeeb Ahmad in mysterious circumstances, etc. These incidents mounted pressure on Prime Minister Narendra Modi to divert attention of the people and come out with the announcement that could be hailed as unparalleled in independent India’s history. This announcement impacted the psyche of the nation as the headlines of electronic and print media dramatically changed immediately after the Prime Minister addressed the nation on the night of November 8 last year. Few, or no economists were consulted before embarking on such an exercise of far-reaching consequence. 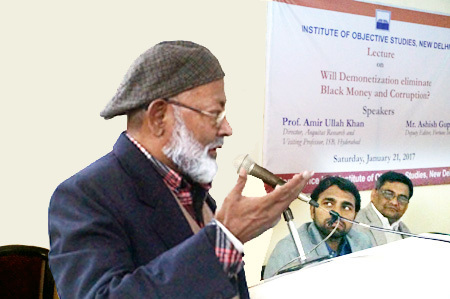 Prof. Khan said that the first announcement made by Modi soon after coming to power was related to the amendment to the land acquisition law to make land available for development work. Secondly, he had promised to take steps for up valuing rupee against American dollar. Similarly, he had promised to put Rs 15 lakh into the kitty of each member of an Indian family by bringing back the black money parked in tax havens abroad. Several BJP leaders were said to have been apprehensive of attacks on themselves if they visited their constituencies due to the non-fulfillment of this promise. He noted that these were the reasons that prompted the Prime Minister to go ahead with the demonetisation move that was purely a political decision. He said that not a single economist or an accountant was involved in the decision-making. The impression gained ground that the public in general supported the decision as there was no opposition from the people. 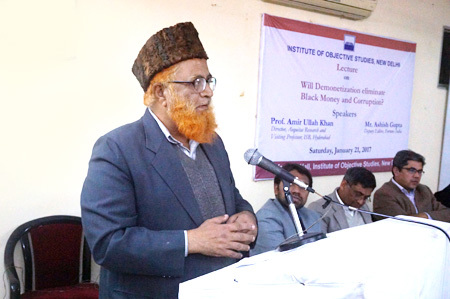 Illustrating his point, Prof. Khan said that 85 percent of the people who did not go to ATMs (Anytime Money Machines) supported the move. Similarly, 75 percent of those who lined up before the ATMs, supported demonetisation. 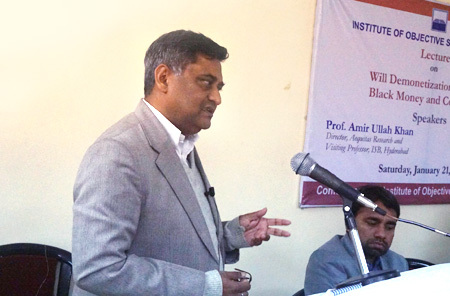 Referring to cashless economy, Prof. Khan said that initially it came from Australia and the US. It was part of a fashion to go cashless. Cashlessness had affected the rural population most as the rate of poverty there was the highest. Half of the rural population of the world lived in India and the demonetisation had only added to its woes. This was not so in the case of urban middle class which did not suffer as much as the rural folk did. He did not rule out the possibility of a law being enacted in future that might attract punitive action for possessing cash or gold above a permissible limit. Commenting on the problem of unemployment, he said that it was a matter of global concern. By 2030, there would be no accounting, thus rendering ATMs and banks redundant: After 2050 there would be no jobs at all as automation would replace manpower. A situation had to arrive wherein people would get money which would subsume everything they needed without doing any work. The PM had promised that one million jobs would be created every month, but the data revealed that only 1.35 million jobs were created last year. Instead of raising funds, the government was only levying taxes. Though about 9 percent people were engaged in government jobs or working in the private sector, only 3.5 percent paid taxes. Prof. Khan pointed out that no economist of repute favoured cashless economy. Countries like Ghana, Argentina and Zimbabwe demonetised their monetary units but without desirable results. Internet connectivity was still a problem in the country, particularly the rural areas. Currently, there were two lakh ATMs in the country with 1 billion mobile phones. Remittances received from the Gulf countries each year stood at about Rs 70 billion. He used power point to put forth his view. 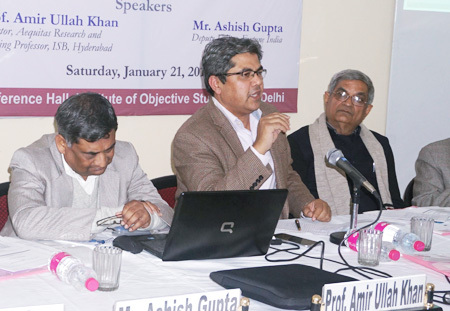 Initiating the discussion, the deputy editor of Fortune India, Ashish Gupta, held that no debate was held post- demonetization. The RSS knew only kala dhan but not black money or black economy. Since business was by and large cash-based, big business and industrialists were scared. Demonetisation had an adverse effect on logistics which required cash at every point. He said that most of the companies had problems in converting informal economy into formal economy. Instead of engaging the people, the Prime Minister talked to them through the media. He had destroyed institutions like RBI, politicised army and the judiciary. The RBI governor was called by the Public Accounts Committee of Parliament to explain demonetisation. The Prime Minister undertook the exercise realising little the damage it would cause to economy. He said that the condition of banks in India was worst in the last thirty years. Public health consultant Dr Bobby John held that Narendra Modi always harped on demographic dividend which meant that the population of youngsters would emerge to take the country forward. Recounting his harrowing experience in the wake of invalidation of high-value notes, he said that about 300 people had formed a queue at the ATM next door to take out money. Demonetisation had made the matter worse for the marginalised population which mostly subsisted on cash. He lost seven kg of body weight during the period. Expressing concern over malnutrition, he said that six lakh babies born were underweight. This was due mainly to the mothers whose food intake was 10 percent less than normal. Advisor to Jamat-i-Islami Hind, Dr Waqar Anwar said that it was unbelievable if the RBI governor could fail to specify the amount of fake notes received by the bank. He said that it was a normal practice of every bank to account for the deposits after the closure of the bank each day. But it was shocking to hear from the head of the Central Bank of the country that he could not give the exact figure. He termed the demonetisation as demonisation of currency. Not a single promise had been fulfilled so far, yet future promises were being made, he said. The Secretary-General of the IOS, Prof. ZM Khan commented that with Narendra Modi in the saddle, a “personality cult” was being built. RSS agenda was being implemented by systematically demolishing democratic institutions. While the slogan of minimum government and maximum governance had vanished into thin air, the authority was being centralised. The decision would have far-reaching consequences for the marginalised sections as they had been hit hard by demonetisation, he added. IOS Chairman Dr M Manzoor Alam remarked that it hardly needed to be explained as to who was at the forefront of violence after Independence. Drawing a parallel between the situation obtaining in the country today with Germany in mid-thirties, he said that Hitler too took the democratic route to become a dictator. Probably it was fear psychosis that prevented the people from protesting against demonetisation. 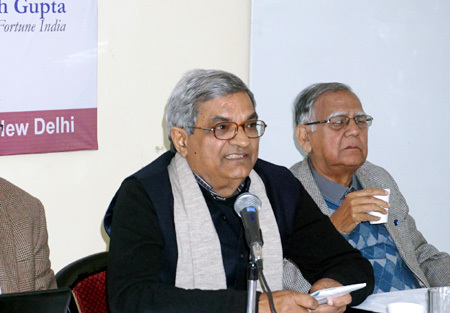 Presiding over the function, former Dean of Social Sciences, JMI, Prof. Naushad Ali Azad, deplored that the government had replaced the Planning Commission with the Niti Ayog which had done precious little to give new direction to the Indian economy. The purpose of demonetisation to root out corruption and unearth fake currency had not been served. As a result of the invalidation of currency notes, both formal and informal sectors were registering a slump. He said that the farm sector was not delivering and the overall growth rate showed a negative trend. Barring Jagdish Bhagwati, no economist of eminence had supported the move, he concluded. Earlier, the lecture began with the recitation of a Quranic verse by Hafiz Athar Husain Nadvi. 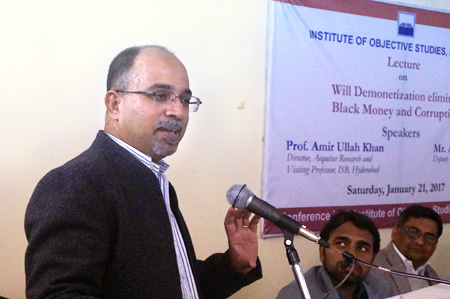 The proceedings were conducted by Dr Aftab Alam, Asstt. Prof. Pol. Sc., Zakir Hussain College. 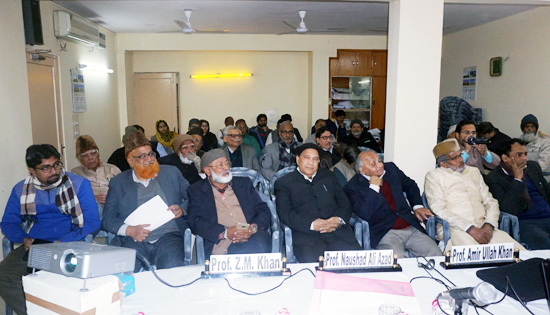 The lecture was attended by university teachers and research scholars, social activists and prominent citizens, including Dr Ahsan, Syed Ahmad Ullah, Dr Md Ahsan Qureshi, Md. Khalid, Chaudhary Wazir Ahmad, Dr Pervez Mian, Hifzur Rab, Shakeel Ahmad, A U Asif, Qamar Ashraf, Dr Bismil Arifi, Haseeb Ahmad, Mirza Zaki Beg and Waseem Ahmad etc.